Though I’m not a professional chef, I am a proud connoisseur of food. In other words I love to eat, so therefore I’ve learned to embrace cooking. Early on in our first year of marriage, Mike came to realize that I wasn’t one to whip up meals in the kitchen and there were lots of trial and error dinners (and late night runs to pick up some fast food). My biggest problem I quickly learned was I rarely tasted my food before serving it. I know, I know that’s a huge mistake. For some reason I figured I could just eyeball the seasonings and it would turn out fine…I was wrong. Your palate and tastebuds are a tremendous part of cooking (just in case you didn’t know). There is nothing like tasting a lack luster meal or an overly salty and saturated one. Either one can ruin it for you. So it’s no wonder why this infamous scripture spoke to me in the midst of all the words, Facebook posts, and endless debates going on lately. Because we all, yes ALL of us, want to be heard. Especially in the name of not being classified or misnomered in this age of labels and identifiers. We all in some way do not want anyone to speak on our behalf, and there isn’t anything wrong with that. Words, thoughts, and ideas so easily get lost in translation in the midst of fingers violently typing and conveying a message that is meant for our mouths and our actions. The internet’s fiberoptic cables have jaded our eyes to reality. Our emotional and mental tastebuds haven’t felt the authenticity of what life and true conversations have to offer in quite some time…and that’s the significance of being referenced as salt. You know the taste of a well flavored meal. Salt is a common ingredient we all have used, more importantly it has so many uses. Nothing can replace salt, that’s the truth. Historically and presently being used to preserve meat, an antiseptic in medicine, and bring flavor; salt is a vital spice to life! However, as Christ followers we can see a verse like this and immediately sprinkle our salt and ideas to the point of distaste. You don’t think that’s possible? Ever been around a fellow Christian or someone who wears that label, and after talking you feel discouraged and turned off? I know that I have and I know there have been moments where I’ve been that person. Pouring my precious salt in the “name of Christ” only to turn someone away. I hadn’t portioned what could bring out God-flavoring in the situation, but rather my own selfish desire to be heard or seen as “Christian” enough overshadowed an opportunity. Read the verse once again and take a moment to taste the bitterness of an excessive amount of salt. That’s what we are called NOT to be. In other scriptures we are urged to let our speech always be with grace, as though seasoned with salt (Colossians 4:6), with the key word being seasoned. That implies tact, control, and portion. I’m so challenged as I’m prone to allow my words to flippantly chastise, control a situation, and trample on the voices and emotions of others…causing a much saltier and damaging situation. But take hope! As we cook up delicious meals in our conversations and situations with friends, family, our kids, and especially online may we season each with salt. Being careful to know the power of Christ entrusted with grace in our lives that we should urgently share with others. Taking time to prayerfully seek God’s hand rather than our own when we pick up scripture, wisdom, and words to bring out the God-flavoring in our world. 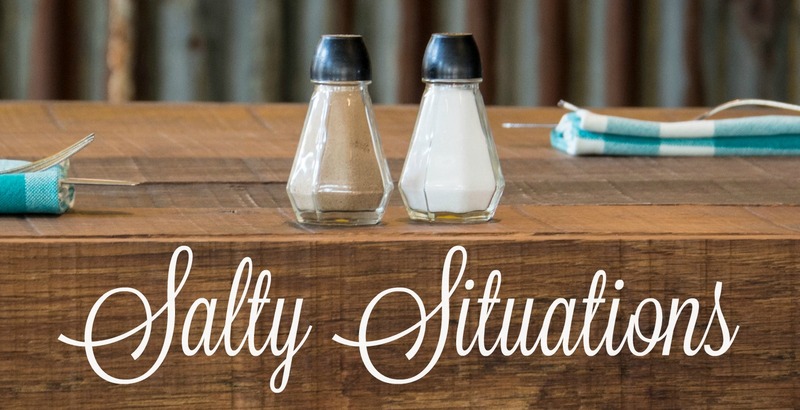 Leaving a situation seasoned rather than salty is the best we can offer today. So friend before we post may we imagine our words as rather a pinch of salt or a dose of disastrous distaste in the making. Valuing the opportunity we have to not fight to be heard, but fight to allow God to bring about His glory in us AND those involved. May we be the sprinkle chefs in our communities, knowing what we hold is so precious and so vital! I love what I recently read on a post from Jen Hatmaker and I couldn’t have said it any better. May you be encouraged and challenged as well friend! “Sisters, don’t spend your energy spitting into the wind to win over people who will not be won. Don’t say passive aggressive things to take jabs at critics who may or may not even be listening. Stop having arguments in your head, however much you may be wining them. Drop it. Drop it all.